Even though I've unpacked my cold weather wardrobe, I'm still in a transitional phase. I cleaned my closet and donated at least half of my clothes especially the winter garments. 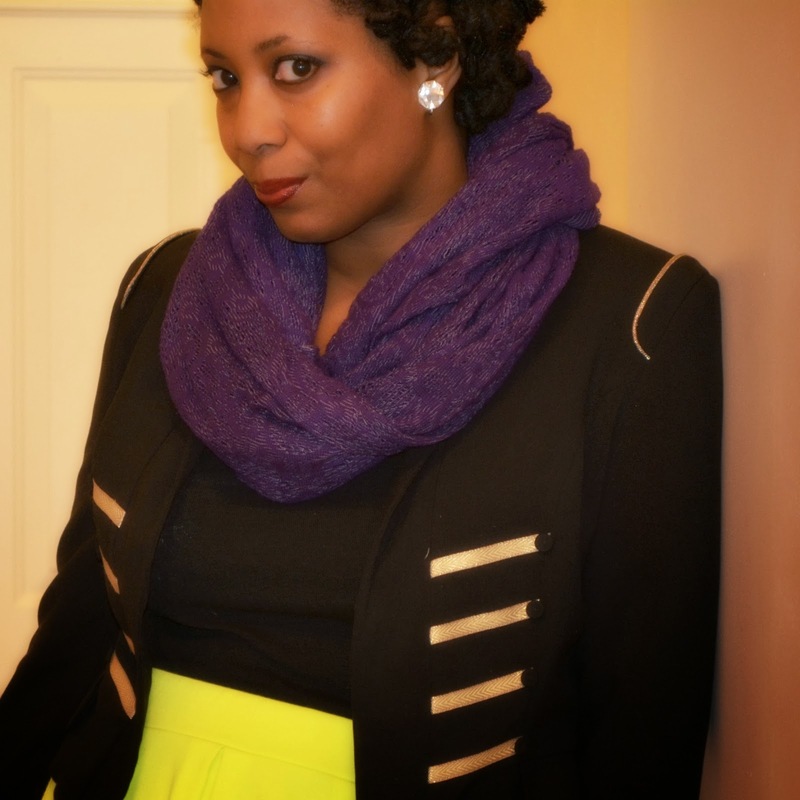 I did hold onto a couple of my favorites -- the thrifted military jacket and the neon skater skirt. Who knew they would look so good together? 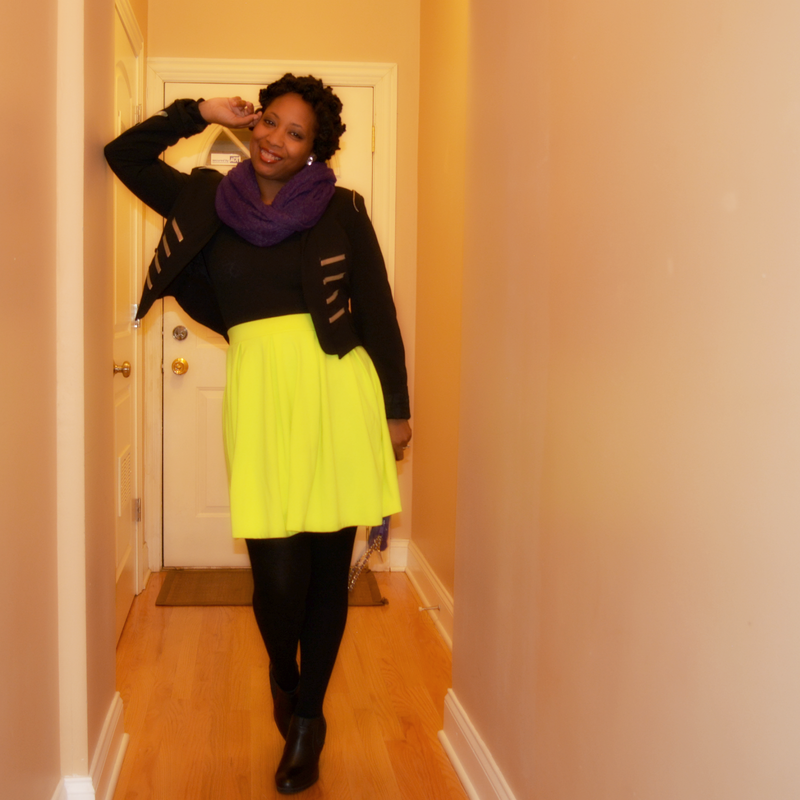 The neon skater skirt is going to stick around for a bit. It's a thick enough knit to function as a multi-season piece. I kind of love it paired with black. It's a gift from my mom that keeps on giving. Surprisingly, I've only worn it one other time. I received so many compliments on what I'm sure is a mall clearance item (I know my mama). I can't go wearing it all the time though. It doesn't exactly blend in. The military jacket is one of my favorite finds from earlier in the year. 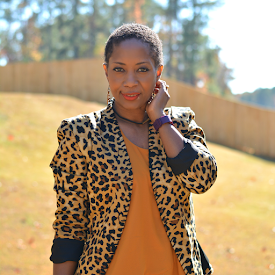 There's no shortage of thrift store blazers and jackets but it's rare to come across one so trendy. There are so many great details and most of them are in metallic gold! It's been a while since I "purpled" out. I was all set to wear black and lime green but the newly found purple clutch wanted to get in the mix so I kept on piling on with the purple scarf and a purple ring. 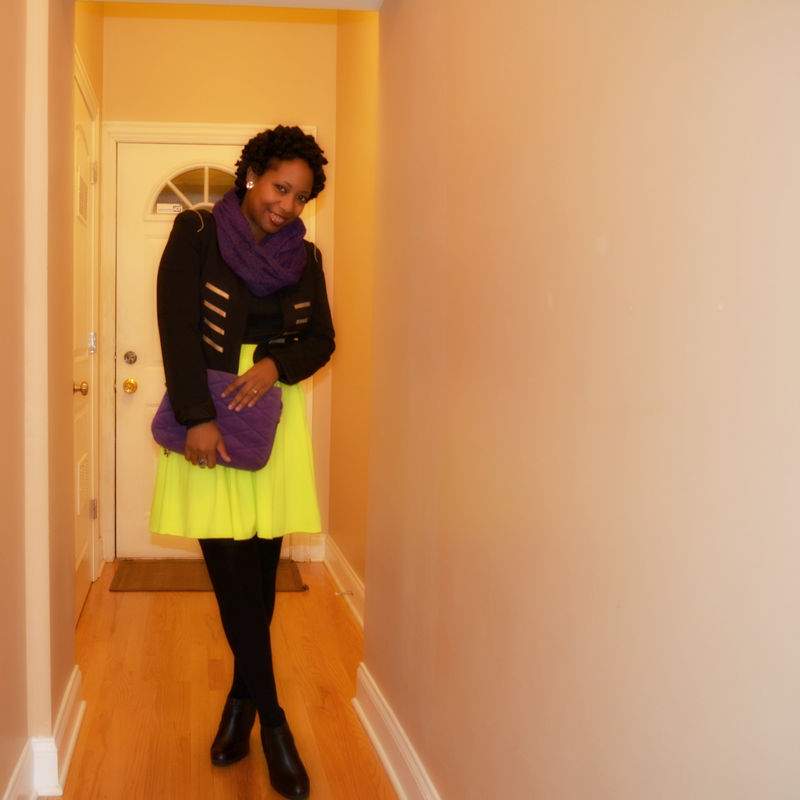 Off to enjoy an ethiopian feast and a little reggae with friends. I didn't do a Monday Thrift & Style. The structured post keeps me from rambling but sometimes I'd just rather ramble. Ya know? Want to know what's up with my hair? This instagram pic should explain. 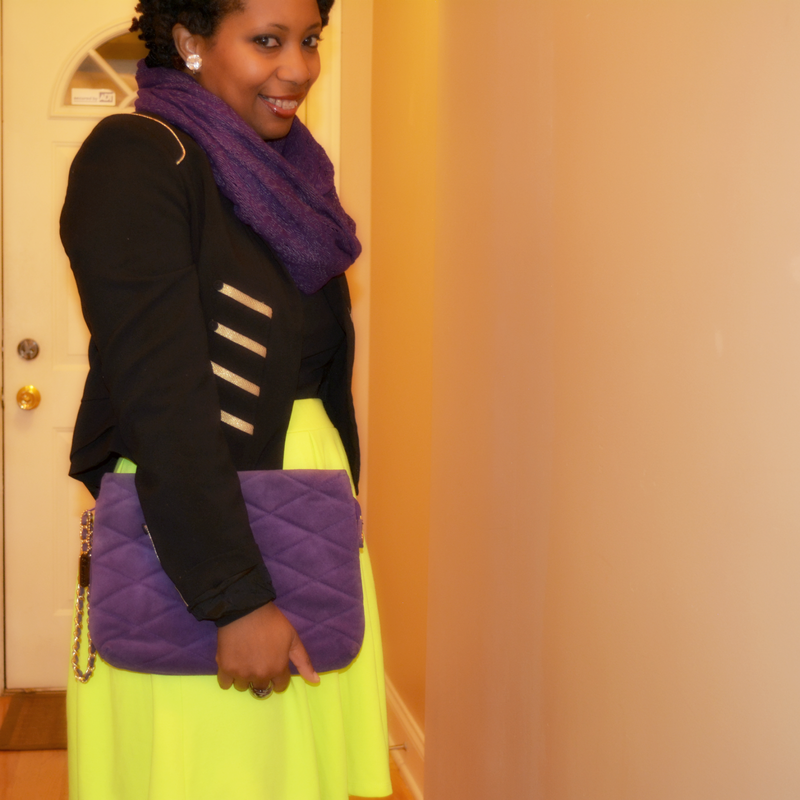 Love the outfit exp the purple! I can't get over how you got all those dreads to curl like this. Super CUTE! Great look and fabulous skirt...you hair looks super cute! I love your hair! I'm surprised how much I like the skirt. 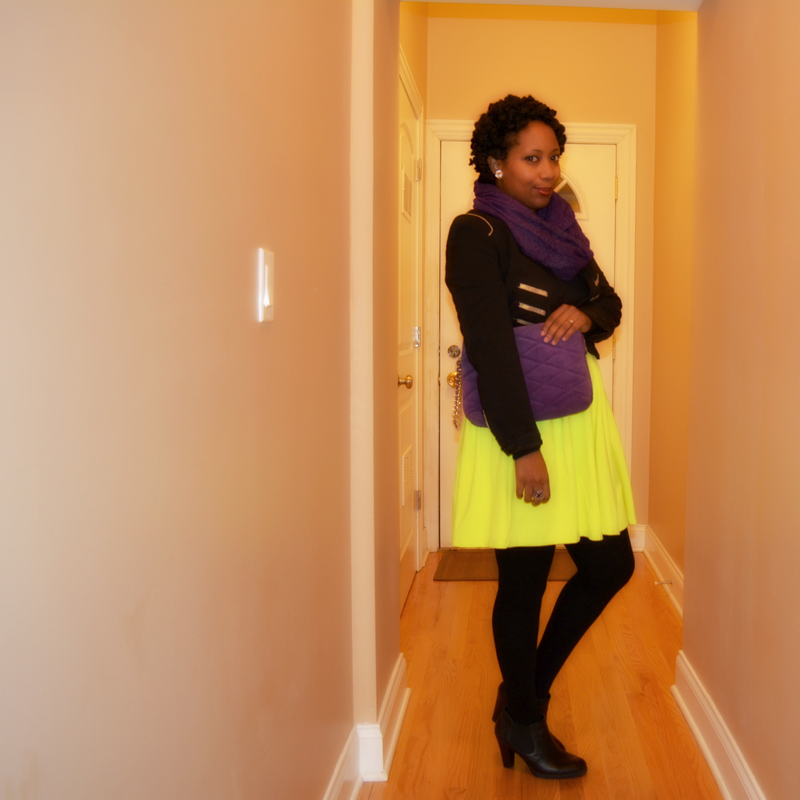 Neon makes my skin look sallow so I can only have it in small doses. I'm wondering if I tone it down with all black and just accents will it look good like it does on you? I'm jealous of that jacket! I've never found something that trendy at the thrift store. I get my basics there and get trends at Target. Good job! I am diggin that skirt! I don't own a skater skirt, I think I may have to star hunting. Love this combo - wouldn't have thought it would work but it werks!!! Hopped over from Thrifters Anonymous. I like - especially the pop of purple. It makes the whole look glow even more. This is such a fabulous look!! Just gorgeous! All the pops of color look great! Very chic styling!